This month, on 9th November, six weeks after Scotland voted to remain a part of Great Britain, ‘a self-determination referendum’ was held in Catalonia. The citizen participation process on Catalonia's political future was originally the 'Catalan Independence Referendum' but was rebranded as a 'popular consolation' after the original was suspended by the Constitutional Court of Spain. The Catalonians who voted, expressed by a whopping eighty/twenty percent majority their preference to be self-determining. This result did not surprise me one bit. Last year, I was caught up in a demonstration in Barcelona and no one could deny the massive turnout and the fervour. Four weeks ago I was in Sitges with my husband as participants at a Mediterranean documentary film festival. We attend MEDIMED every year and make an outing of it, driving along the coast from our Olive Farm outside Cannes, crossing the border into Catalonia, through Barcelona, the capital of Catalonia, and landing up for five days in the port city of Sitges. I have a very soft spot for this city with its beautiful Baroque cathedral where I attended the sung Saturday evening mass celebrated in the local Catalan tongue, which is a romance language and quite similar to our own Provençal. In Sitges, indeed all over Catalan, menus, road signs, notices are all written in Catalan and I have great fun trying to see how much I can decipher or link back to the Langue d’Oc. The seventeenth-century cathedral Iglesia de Sant Bartomeu i Santa Tecla is perched on the Baluard headland and overlooks both the Mediterranean, the town, its esplanades and beaches. So identifiable is it, both from land and sea, that the locals refer to it as ‘La Punta’, the point. Even if attending a service is not of interest to you, the interior of the church has some splendid artwork and an organ dated 1699, movingly played on the night I attended mass. Steps from the church stands the Palau Maricel where the doc film festival was held annually until last year. Since which time the building with its elegant white façade has been closed for renovations. The palace started life as the hospital Saint Joan Baptista in the fourteenth century. 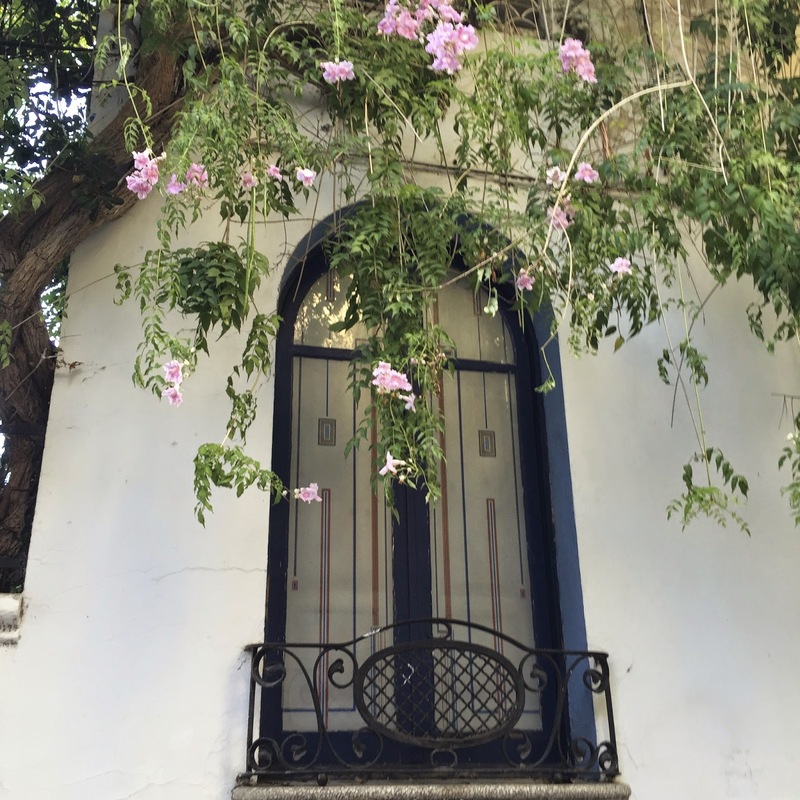 It was rebuilt in 1911 and newly designed by the engineer and artist Miguel Utrillo who transformed it into a private mansion for the American art collector and philanthropist, Charles Deering, who owned works by amongst others El Greco and Murillo. Today, the building is owned by the Barcelona Council and operates as a museum and the Historical Archive of Sitges. While the museum has a vast collection of art from medieval to modern, the neighbouring palace is separate and is used for cultural events. In this sumptuous building, four years ago I stood in the Blue Room, one of its ornate salons, almost Arabesque in decor, and pitched the films of The Olive Route to a very hard-crusted professional audience! The Catalonian coast was an artist’s haven at this period with notables such as Miro and Dali living and working here. Gaudi, too, who refused to speak Spanish and would only communicate in Catalan. Set back from Plaça Baluard lies the old town, a treasure chest of stunning architecture and dazzling plantlife growing up and around the buildings. During the eighteenth century, many residents of Sitges took the ‘American Route’, which is to say they sailed to Cuba to make their fortunes on the island’s many plantations. When they returned they invested their money in the construction of mansions. One of these families was the Bacardi clan. The town is a dazzling collection of Art Nouveau and Modernista homes, many of which are now hotels. Take a stroll along the esplanade, Passeig de la Ribera, and you cannot miss the fine and colourful display. I first visited this city in 1962. In 1962, Spain was still living under the dictatorship of Francisco Franco who ruled Spain as a totalitarian state from the end of the Spanish Civil War until his death in 1975. It was a long bleak road for the nation and by the time my parents and I arrived by car from England a fair proportion of the population was close to starving. Tourism was a very new business. The country had been cut off from international aid and exchange for many years. So desperate were some of the farmers and rural peoples, that they sold off their coastal farmlands for next to nothing to foreigners who began building beachside villas and resorts. It is from this decade that the Costa Next to Nothing mentality was seeded. The Spanish Civil War and the ensuing decades of Francoism is a huge subject and not one to attempt to address in a page such as this. Many great writers have written on the subject, including the obvious and essential early war tomes: Laurie Lee’s As I Walked out One Midsummer Morning, the works of Federico Garcia Lorca who was murdered beneath an olive tree by the nationalists outside the small and rather haunting town of Viznar, ten kilometres from Granada. His body was left at the roadside, perhaps thrown into a mass grave but, as far as we know, never found or retrieved... I have written at length about the impact of the Spanish Civil War followed by the decades of Francoist rule on Spain’s olive oil culture in The Olive Tree. From pre-Rome to the present day, Spain has been a major supplier of olive oil. Today, the Spanish are the world’s leading producers of olive oil, much to the chagrin of the Italians!. But I digress. Sitges, Catalonia. 1962. I was an adolescent and quite possibly had never heard of Franco and most certainly knew nothing of this city’s, this region’s ceaseless and very brave fight against the nationalists. In fact, in the 60s, this beach town became famous for ts counterculture, the artists who resided there or visited during the summer months. But we were just visitors looking for sun. I remember my father asking our waiter about the meat we were being served and the shock he expressed when the waiter replied ‘Ee-aw, Ee-aw’. ‘Donkey!’ spluttered my father in disgust and immediately took to his bed. No doubt the people of Sitges back then, would have been grateful for a plate with a juicy steak on it. No doubt our waiter’s family must have fallen to their knees in gratitude for their young son’s modest pay packet. The first days of tourism. I also remember going to mass with my mother at Sant Bartomeu and how surprised we were to find that a christening service was under way. Not one child was being baptized but dozens, queues and queues of infants swathed in white being carried along the aisle. Only later did I learn that the people were so poor, families couldn’t afford to pay the priest to baptise their child so they waited until there was a group of newly born and then together they booked the padre’s services. Sitges today is famous for being one of the gay capitals of the world. It is another expression of the region’s tolerance and acceptance and a strike against right-wing Catholicism. We stay at the Hotel Romantic, a three-star establishment in the old city, but a very unusual one. The hotel has been in the family for generations, houses a vast collection of paintings and ceramics and is an opportunity for gleaning first-hand history. The present proprietor’s father fought against the Republicans and was sent to prison but freed, unharmed, when the nationalists marched into Barcelona and took Catalonia. The Catalan president, Lluis Companys, fled but was arrested in France by Gestapo agents, returned to the nationalists and executed. This was the beginning of Catalan as a forbidden, an underground language. The region's culture and tongue were outlawed. 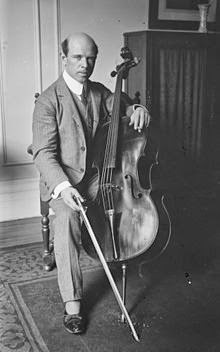 Pablo Casals, or more accurately Pau Casals, the eminent cellist and conductor, fled his beloved Catalonia when the nationalists took control. He swore then he would never return to his village, nor to Spain, until Franco had been deposed and democracy reinstated. He took refuge across the border to France, to Prades. Later he settled in Puerto Rico where he died at the grand age of ninety-six. His tragedy, and the same for Pablo Picasso from Malaga who had taken the same oath, was that he died before Franco. A mere two years earlier. He never set eyes on his homeland again after 1939. When I was beginning my travels for The Olive Tree, making my way south through Spain towards Morocco, I visited the Phocaen-Greek ruins of Empuries on the Costa Brava coast north of Barcelona. There I found what was then a modest white hotel set in the Bay of Empuries, feet in the water. I stepped in for lunch. The menu was, of course, in Catalan, nothing in Spanish. The owner who I talked to briefly was a distinguished-looking local gentleman, all his staff were also locals. They spoke Catalan between them. The menu proposed only local dishes. I was trying to trace some of the words back to the Phoenician tongue. For a short while, Empuries was an entrepot for the Phoenicians and they set up fish-salting factories close by. I was scribbling, working, enjoying a glass of cava, which is a Catalan not Spanish bubbly wine although it is also produced today in other parts of Spain. As I lifted my head from my notebook, I tuned into the music playing on the DVD player. Pablo Casals. It was no coincidence. I understood then that I had not yet reached Spain. I was in Catalonia. Thank you, Carol - lovely start to the morning. Catalonia always feels very much its own country - and the language is interesting (even living down the coast in Valencia managed to stumble through the dialect with a combination of French and Spanish). How sad that Pau Casals, and Picasso, did not live to see their country free again. Thank you Carol, I don't know enough about Spain but you have intrigued me to look more. Thanks, Carol - fascinating. My stepson, partner and 5 yr old twins live in Barcelona so we visit about once a year but still can never see enough. They will be over for Christmas so I'll try to remember to show them this for their comments - his partner is Catalan and the children are being brought up triingual - Catalan in school, Spanish with grandparents and English at home! Oh Dear! Do remember that there are always two sides to a story! To really understand history you need to also study the other side. Plus the history of Europe as a whole for that period, including what happened to communist countries during the same periods. This is wonderful piece Carol and enjoyed it immensely I have quite a few dealings with Catalonia and see more and more the distinct difference between the people, the language, their cultural heritage, their cuisine and more. As is also the case with several other regions within Spain too. I am pleased that you have highlighted this. I adore this article. As a student I had the fantastic experience of being able to study in Palma, Mallorca. The warmth and complex depth of the Catalan culture hit me as soon as I departed my plane in Barcelona- all I knew of Spain was Catalonia. After some months I managed to hop on a train north to Madrid on a free weekend and found myself in a Spain completely unfamiliar to me. Not only were the dialects and customs completely different, but life seemed more rushed and impatient. After returning to Mallorca I heard more on the topic of Catalonian succession from the north and can see no reason that they should be denied that. The people there have long had a very secure sense of identity which is absolutely "Catalan" and not so very "Spanish" at all.